The inquiry has faced plenty of criticism before. 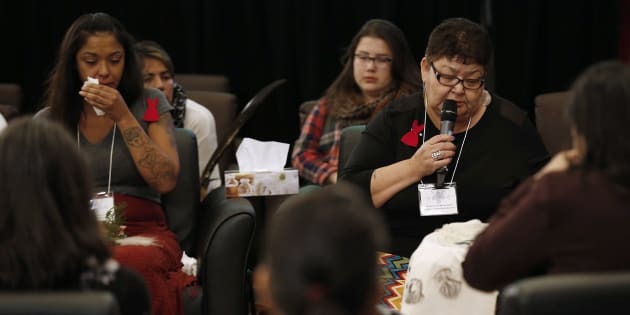 Family members speak at the opening day of Winnipeg hearings at the National Inquiry into Missing and Murdered Indigenous Women and Girls on Monday. WINNIPEG — Just one of the many cases of missing and murdered Indigenous women has left a Manitoba community divided, a family struggling with grief and a mistrust of the justice system, a national inquiry was told Tuesday. On its second day of hearings in Winnipeg, the inquiry heard about the ripple effects from the killing of Roberta McIvor — a 32-year-old woman who was decapitated on the Sandy Bay Ojibwa reserve northwest of Winnipeg on July 30, 2011. "It's really hard on me still. I still sometimes cry myself to sleep at night,'' McIvor's daughter Justine Strong said, sobbing occasionally as she spoke. Roberta McIvor was 32 years old when her body was found on the side of a road on Sandy Bay Ojibway First Nation. Strong was 14 when she last saw her mother, who was going out for the evening to visit friends. McIvor's body was found the next morning — her head on one side of a road, her torso on the other. Authorities told the family the decapitation was inadvertent and caused by a seatbelt during a violent carjacking. Two teenage girls from Sandy Bay pleaded guilty to manslaughter and were sentenced to two years in custody and one year of supervision in the community. The family immediately had doubts about how accidental the decapitation was. It occurred on the third anniversary of the death of Tim McLean, a young carnival worker who was beheaded by a fellow passenger aboard a Greyhound bus on a Manitoba highway in a case that made international headlines. The family also believed others in the community of 2,500 were involved in the killing, perhaps by helping out the killers before or after. Suspicion and rumours grew. The family did not know who to trust. "My community was so split in half that people were hiding murderers within our community,'' the victim's cousin, Alaya McIvor, told the hearing. The family was taunted, McIvor added. Strong said she left Sandy Bay right after finishing high school. The inquiry also heard about the death of Cherisse Houle, 17, originally from the Ebb and Flow First Nation — an Aboriginal community 40 kilometres down the road from Sandy Bay. Her body was found in a creek bed just outside Winnipeg on July 1, 2009. Her death remains a mystery and no one has been charged. "I know for a fact someone took my daughter to the outskirts and killed her,'' the teen's mother, Barb Houle, told the hearing. As with the McIvor family, Houle's death had a ripple effect. Her mother recalled spiralling into depression and substance abuse. Cherisse's brother, Jordan, died in a shooting in Winnipeg three years later. Cherisse's young son was left without a mother. "The other day, I had him and ... he said, 'If I could have one wish, I wish I could see my real mom for one day,''' Barb Houle said. The Winnipeg hearings follow earlier meetings in Smithers, B.C., and Whitehorse, Yukon. The inquiry has faced criticism from some families about delays, poor communication, a lack of transportation and accommodation support. One commissioner and some staff members have resigned. Alaya McIvor told Tuesday's hearing she does not have faith in the process. Her remarks were met with some applause from the audience.